Tripp Lite's 16-Port 1U Rackmount ST/ST Fiber Optic Patch Panel provides efficient and easy management of fiber optic cables in the rack or cabinet. Pre-loaded, feed-thru duplex multimode connectors are mounted on a 16-gauge, cold rolled, black powder coated steel panel. Use with 62.5/125 or 50/125 Multimode, or, 8.3/125 Singlemode fiber patch cables. Panel measures 19" wide by 1.75" high. The N490-016-STST enables quick and easy cable patching by plugging 62.5/125 or 50/125 fiber patch cables into any of its 16 ST ports. 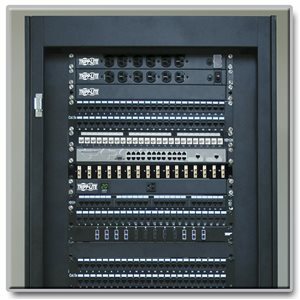 With a convenient 1U, 19-inch form factor, the N490-016-STST’s pre-loaded, feed-thru duplex multimode connectors are mounted on a cold-rolled, black powder coated steel frame. For peace of mind, this product comes backed by a lifetime warranty. With 16 convenient ST ports and a low-profile form factor, the N490-016-STST makes patching cables in high-density IT environments simple. The N490-016-STST ships fully assembled for quick and easy installation. Included mounting hardware supports 1U installation in standard 19-inch rack enclosures. Constructed of top-quality materials and a durable, all-metal frame, the N490-016-STST is built to last. The N490-016-STST comes with a lifetime warranty and is RoHS-compliant, reflecting Tripp Lite’s commitment to environmental responsibility.